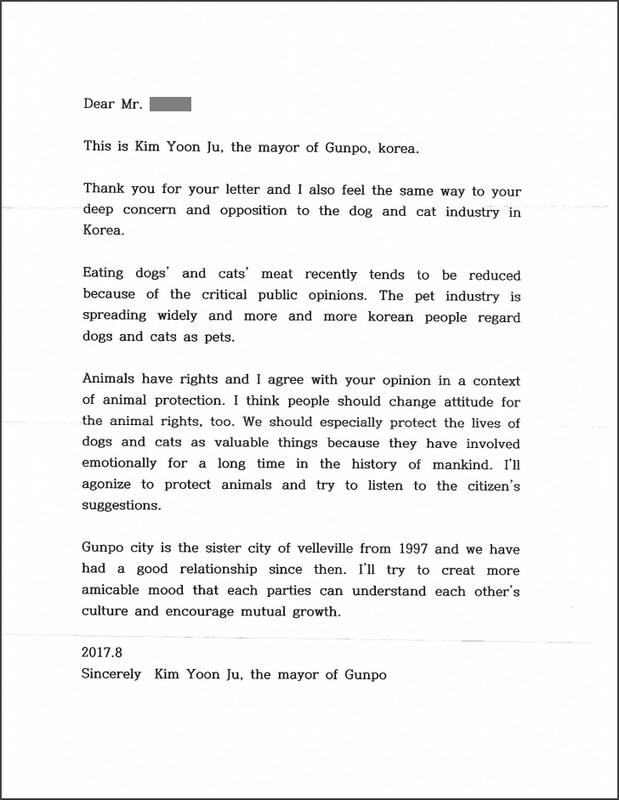 We received a response from the Mayor of Gunpo, resulting from one of our campaigns urging their Sister City, Belleville, Ontario, Canada to speak out against the illegal dog and cat meat industries in Gunpo. We currently have two other active Sister City campaigns against Gunpo– Clarksville, Tennessee, Grant County, Washington. 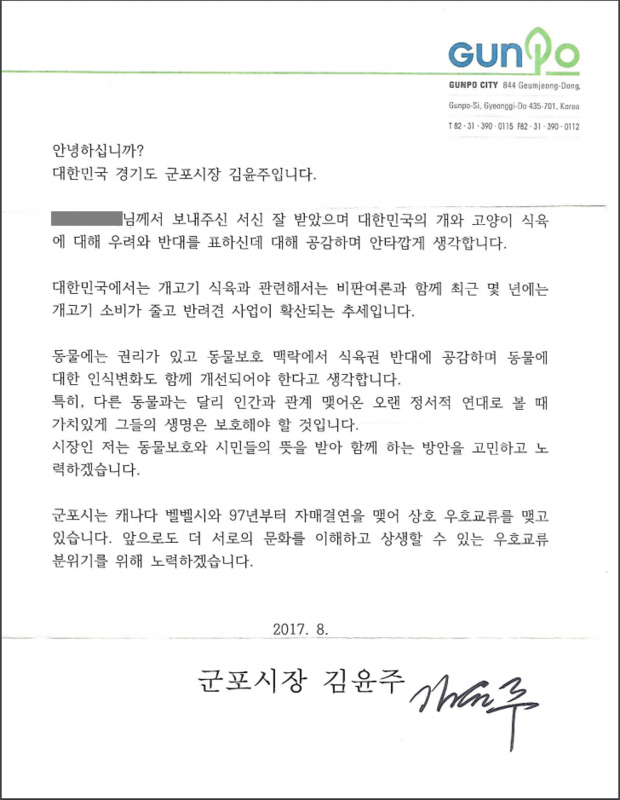 We very much appreciate Mayor Yoon-Joo Kim responding to us and what he says in his letter sounds very genuine. However, it does not contain any promise of affirmative action to end the illegal dog and cat meat industries operating in his city. But we still feel our campaign to be a success as the Mayor and his Government are now well aware that people from all over the world are monitoring them and they realize that we are not going away until the dog and cat meat trades are brought to an end. We are cautiously optimistic that the Mayor will put his words into action in any future policies and decisions he makes for the animals in his city. Let’s keep the pressure on the Korean Government until they aren’t able to stand it any longer. Time to create another campaign. Click HERE for our campaign page: Sister City Campaign – Gunpo, South Korea – Belleville, Ontario, Canada. I don’t think cruelty is Korean culture and needs understanding. Or you, mayor Kim, want me to believe Koreans are worse than I always thought? No, I don’t believe, I know enough anout Koreans. Cruelty must be eliminated and forgotten, not understood. It is good to know that Kim Yoon Ju empathises and that there seems to be a cultural shift in the attitudes of people in South Korea. However his empathy is not enough to save the lives of thousands of dogs and cats brutalised in this industry. We need to keep up the pressure and continue to campaign until South Korea ends the legal farming of our companion animals. However let us not forget the plight of many of our own farm animals many of whom are subjected to the horrors of factory farming and the live export trade. Let us also not forget our game birds who are as I type fighting for survival on our grouse moors and in our countryside, the foxes and their cubs who are still being illegally dug out and hunted, the hares who are still being illegally coursed, the badgers that are being culled in spite of overwhelming evidence that this is not the answer to bovine TB (the list goes on and on). The dog meat trade is barbaric and cruel and must end, but so must the live grinding of unwanted baby cockerels within moments of hatching, the live export trade where our animals are often sold into countries with little or no animal welfare laws, intensive factory farming where many of the horrors of the dog meat trade in South Korea are inflicted on our hens, pigs and cows, and hunting and shooting wildlife for pleasure (the list is endless). Let us unite and fight for all the animals being systematically brutalised in this world for food, for fur and for our “entertainment”. Animal lovers are among the very best people I know so let’s keep fighting let’s keep uniting and hope that we can be a part of making this world a better place for all animals, human and non-human alike. Something must be done NOW.